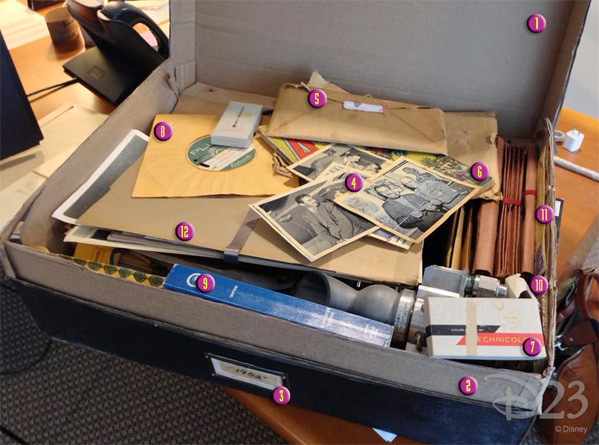 What's inside of Brad Bird's mystery box? Is it time we find out? With the recent announcement of the title Tomorrowland, buzz for Brad Bird's new science fiction film has altered course. Not in a bad way, but in a completely new direction, mainly that it's going to be a Disney family movie with a sci-fi twist. Hints are that the creation of Disneyland is a cover-up for alien contact, something like that. While we wait for casting to continue before shooting begins, Brad Bird's mystery box delivered to Disney a few weeks ago has made the rounds all the way to D23, where they've decided to scrutinize the exact contents. So the plot thickens. So what else did they find? In addition to the 1928 copy of rocketman Amazing Stories detailed previously, they noticed the B&W photos are of Walt Disney with other people. One of them shows Walt with "Major Woodlief of the U.S. Army Reserve General Fund. It was taken in September 1943. The Disney Studio worked closely with the United States government and military soon after the bombing of Pearl Harbor." Ah, so it seems the sci-fi cover-up-through-Disneyland plot does seem to have some truth to it. There's not much else they could figure out that wasn't already picked up on, but it's interesting to read nonetheless. While we've still got almost two years until Brad Bird's Tomorrowland 1952 arrives in theaters, things are already getting interesting. An alien cover-up Disneyland sci-fi story from Brad Bird and Damon Lindelof starring George Clooney? What are we getting into? Here's the other intriguing tidbit from the photo. Her thoughts are that it's "research for a science-fiction-themed film, television, or park attraction, or even a futurism project like Walt's vision of EPCOT." Plus this thought regarding the blue book found in the box: "appears to be a government aeronautics guide for the early half of the 20th century" (via EW). Ideas? 1952 is complete misdirection. No way Disney is going to spend the kind of money this project requires for a period movie. Er, wha? It has a pretty big budget as far as I know. Yes, very large. That was my point. Disney will not take the risk of making a $200M+ investment on a movie set in the 1950's. This will be a contemporary or futuristic action/scifi movie. All of this 1952 mumbo-jumbo is misdirection. They have succeeded in getting the fan community researching events in history around that time, but this movie wont have anything significant to do with the year 1952. Lindelhoff? The guy who f'd up Prometheus? No thanks!